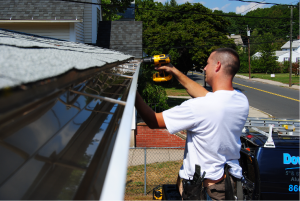 Dow Gutters, LLC is a family-owned and operated business providing a variety of gutter services throughout Southington, Connecticut and surrounding towns. We are committed to serving our customers with integrity, reliability and quality service and the most affordable gutter system anywhere! Our trucks have state-of-the art gutter machines on board, giving us the flexibility to cut gutters to any length for any job, both residential and commercial, right on the job site! WE ARE NO LONGER PROVIDING GUTTER CLEANING SERVICES.